Thank you for exploring options to stay with us at the University of Alaska Southeast! As an institution of higher education, we are fortunate to have the opportunity to extend our hospitality to other educational groups and community partners, in accordance with our institutional objectives. We have four unit types to choose from, including two suite-style residence halls (John Pugh Hall and Banfield Hall) as well as two-bedroom apartments, four-bedroom apartments. All of our unit types have a maximum occupancy of four people per unit. We also have one Guest Apartment: a two-bedroom apartment up-fitted with higher quality furnishings and a kitchen stocked with basic cooking implements, flatware, and place settings. This Guest Apartment is available year-round and a great option for visiting faculty, guest lecturers, prospective students and families, and others. To inquire about availability, please submit a reservation request. Keep in mind that these same units are used during the academic year by our resident students and so availability during the academic year is less than during summer months. We have three types of housing units in our complex: suite-style residence halls, four-bedroom apartments, and two-bedroom apartments. We rent these unit types out by bedroom or entire units — not individual bed spaces. Please see our rate sheet for additional details on unit layout. A linen pack — with sheets, towels, bathmat, and washcloths, as well as a blanket and pillow are provided for each bed space with rental. Other items may be requested for an additional fee, such as extra pillows, blankets, and towels. Maid service is not provided. Guests may exchange their linens for a fresh linen pack for a fee or they can launder their own. Kitchen supplies, i.e. cookware and utensils, are not provided with the apartments. Vacuums, brooms, plungers, cleaning supplies, and toilet paper are provided at desk locations free of charge. Guests are requested to submit a photo ID (i.e. drivers license, student ID) which will be held in exchange for equipment usage. We have community laundry facilities in Housing that require pre-loaded swipe-cards, which can be purchased at desk locations. A wash and dry cycle costs $3 per load. Free wireless internet access is provided. Note: Copyright infringement is easily detected and is taken very seriously. Wireless access may be restricted if such violations are detected. The Housing Lodge is open 24-hours a day, including access to the laundry room and TV lounge. Due to the presence of bears and other wildlife, guests should never leave trash outside. Additional trash bags may be requested at desk locations. Recycling disposal is also available. Public phones that allow local calls only are located at various places throughout Housing, however, we do not have phones in units. Community Advisors are trained student, paraporfessional staff members who serve as guest service agents as well as maintain university and Housing policy. They assist with check-ins, lockouts, noise complaints, policy violations, crisis response, and much more. A Community Advisor is always on-duty, and there is always a professional staff member on-duty to support them. Please contact the Community Advisor On-Duty at 907-209-6539. The central community Housing Lodge contains the guest services desk, a TV room with cable access and DVR, various study areas, meeting rooms, and laundry facilities. Free wireless internet access is provided throughout the entire Housing complex and in all units. Groups should be aware that the Housing Lodge is a community resource and that reservations for this space are not always available in an effort to maintain accessibility to all of our residents and guests. Check-In location is dependent upon your placement. Guests staying in John Pugh Hall will check-in at that location at 11090 Auke Lake Way. This building is secured for access by swipe-card only and guests checking in outside of desk operation hours of that location (12–5 p.m.) will need to call 907-209-6539 for assistance. Guests staying in Banfield Hall and apartment units will check in at the Housing Lodge at 4300 University Drive. Guests checking in outside of desk operation hours of this location (9 a.m.–10 p.m.) will need to call 907-209-6539 for assistance. Check‐Ins after 10PM will result in an additional fee of $25. Check-In begins after 3 p.m. on day of arrival. Check-Out should be completed by 11 a.m. on day of departure. Upon departure, remove all trash and personal belongings, ensure all doors are locked, and return keys. Key drop boxes are present for your convenience. Full payment is expected upon arrival. We will gladly accept most credit and debit card issuers and networks. Checks and journal vouchers are also an acceptable form of payment. Pets are not allowed in any building or residential facility. Quiet hours begin at 10 p.m. and will be enforced both indoors and outdoors. Additionally, we uphold a 24-hour courtesy policy for the entire UAS Housing community. We understand that guests are here for various reasons in the summer months, but we have many students completing summer course work. First and foremost, it is our mission to provide an atmosphere supportive of those endeavors. Smoking and tobacco use is prohibited on all University of Alaska property both indoor and outdoors, including all residential units. Smoking in the unit will result in a $250 fine for cleaning charges. As an institution of higher education, we promote personal wellness through healthy lifestyle choices and strive to maintain an environment that encourages courtesy and resepect towards others, as well as being reflective of our institutional values. As such, we take these policy violations seriously. Only guests 21 years of age or older may consume or be in possession of alcohol in the privacy of their own unit. Residence Halls are alcohol-free regardless of age. No possession or consumption is allowed in the presence of minors or outdoors. The possession, use, or sale of marijuana or any illegal substance on the UAS campus is prohibited. Replacement fees are $100 for room keys, $25 for mailbox keys, and $10 for swipe-cards. For guest safety, lost keys and cards should be reported promptly. All refund requests must be received in writing. A cancellation fee equal to one night’s stay will apply to reservations cancelled less than 14 days prior to arrival. Once checked in, guests will not receive a refund greater than 50% of prepaid, unused nights stay. The fire/smoke detectors in our units are sensitive. Please use the exhaust hood above the oven/stove range when cooking in the kitchens. If the fire alarms go off within your building, all guests are expected to evacuate the building and await official notification from staff to re-enter units. Important note for individuals requesting space within a group block: The arrival and departure dates for group blocks are originally set by the program or group coordinator who made the reservation. We cannot guarantee the availability of space outside of those original dates. Should you need to arrive earlier or stay later than the original dates requested, please submit your Reservation Request Form as soon as possible. Check-in begins after 3 p.m. on this date. Check-out is by 12 p.m. on this date. For reservations requiring clarification of roommate assignments, staff will send a chart or floor plan to assist with placement. 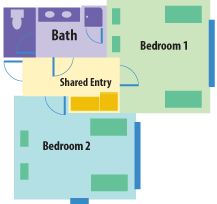 Our unit types offer either single bedroom placements or shared bedrooms, so identifying roommates will help greatly. Groups with participants under the age of 18 must comply with UA Statewide requirements for chaperoning minors. Placement for such groups may be limited to Residence Hall unit types to ensure proper supervision. This provision does not apply to minors accompanied by parents or legal guardians. Banfield Hall is booked for Summer 2019 with no available vacancies or waiting list. Interested parties should look to our John Pugh Hall, two-bedroom apartments, or four-bedroom apartment options. UAS Summer Guest Housing is a Cashless Operation. We accept only credit, debit, and check payments on-site. Please see our summer guest housing policies for information on cancellations and refunds. Recreational Guests are members of the public or patrons not directly affiliated with the University of Alaska Southeast. Academic Guests are affiliated, sponsored, or enrolled in a University of Alaska program activity, or coursework that corresponds directly to the requested stay in Housing. If confirmed, UAS Housing staff will contact you to receive payment information. If choosing, "UA Student Account", please provide your UA student ID number in the field provided. Please fill out if you have selected "UA Student Account" above. Furnished two bedrooms—each with two twin beds, accommodating up to four individuals in the entire unit, or two per bedroom — with two desks, dressers, and closets per bedroom. 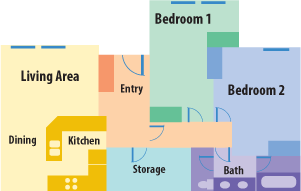 Units share a common entryway and bathroom. Most suites include a refrigerator and microwave. Commons areas and a shared kitchen are available in the building. Suites have a shared bathroom. The common foyer has a refrigerator, microwave, and cabinetry. A communal kitchen is located in the building and has two oven/stove ranges, sinks, microwave, and coffee maker — limited cookware is provided. In addition, there are several large common areas, laundry facilities, and a seminar room available. Two bedrooms — each with two twin beds, accommodating up to four individuals in the entire unit, or one per bedroom — that share a full bathroom, living room, and kitchen. Apartments have a full kitchen with a full-sized refrigerator, oven/stove range, microwave, and large amounts of cabinet storage. Cookware, dishes, flatware is not provided. Four bedrooms — each with one twin bed, accommodating up to four individuals in the entire unit, or one per bedroom — that share a full bathroom, living room, and kitchen. Apartments have a full kitchen with a full-sized refrigerator, oven/stove range, microwave, and large amounts of cabinet storage. Cookware, dishes, flatware is not provided.